Apple is currently having one of its biggest sales this year, offering 100 apps and games at “new low prices”, most of which are going for as low as US$0.99. If you’ve always wanted to get certain apps or games but are too expensive, you should check out the promotion to see if the app is on sale. 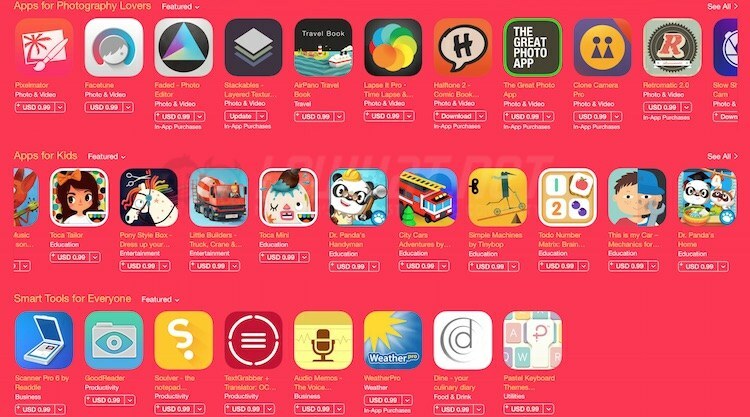 Apple is offering a wide variety of apps and games this time round, including apps for productivity, photography, kids, as well as plenty of well-known games. Some of the deals that stands out include Pixelmator (usual price US$5), GoodReader (usual price US$5), Rayman Jungle Run (usual price US$3), Real Racing (usual price US$5), which are all going for US$0.99 right now. For those of you who are familiar with kids apps, famous titles like Toca (Hair Salon and Mini), Dr. Panda (Bus Driver, Handyman and Home) are going for only US$0.99 too – the original prices of these apps are usually US$2.99. Apple is also offering famous App Store titles at a discounted price like Angry Birds, Fruit Ninja, Cut the Rope 2, Need for Speed Hot Pursuit and Most Wanted, Bad Piggies and more. Check out the promotion page on App Store now to see the full list of apps and games that are on sale.